Many of the bars in Castello are "local's locals", each with their own set of loyal regulars and all with distinctly homey vibrations. But, even here, you'll find a wide variety of nightlife from tiny bacari with live music to the tranquil Serra Dei Giardini which offers gourmet food, cocktails and concerts inside a restored greenhouse. Salumeria, the Bacaro Contemporaneo (contemporary bacaro), recently opened in Via Garibaldi is really uniquely wonderful among Venetian bars in its combined offerings of carefully prepared foods, excellent wines and very friendly owners and staff. Those who are interested in cooking and wines, will also discover that the owners are very passionate about their work and excited to share their knowledge of Venetian food and wine with visitors. Just be warned that this is the kind of place where one's visit tends to last a little longer than one planned. You will likely find yourself nibbling just one more crostino with the house bacala, another "candy" (the house baked meatballs), and sipping another glass of wine while you're at it. It is just so pleasant to be here! Why would anyone ever want to leave? Osteria A La Scuela, 3183/A Castello, On Salizada De Le Gate. One of few places left in Venice where you can still get a one euro "ombra" of the house wine, meet your neighbors and their dogs, and where there seems to be no friction at all between Venetians and tourists. A La Scuela is a cozy neighborhood osteria with a down-to-earth attitude, simple (and yummy from what I've tasted) local foods and regular regulars from the buildings around. Hear Frito Misto play live music on Saturday evenings, or drop bye anytime for a completely relaxed drink & snack. In quiet corner near a canal, but only a few moments walk from either Campo Santa Maria Formosa or Campo San Giovanni e Paolo, you'll find this intimate and well-tended bacaro offering simple and healthy venetian cicchetti and snacks, local and regional wines, and, most importantly, genuine Venetian bacaro hospitality. This cozy bar is one of those special local spots where disparate groups of clients - both locals and tourists - begin to naturally mingle and the conversation sometimes goes on for hours. 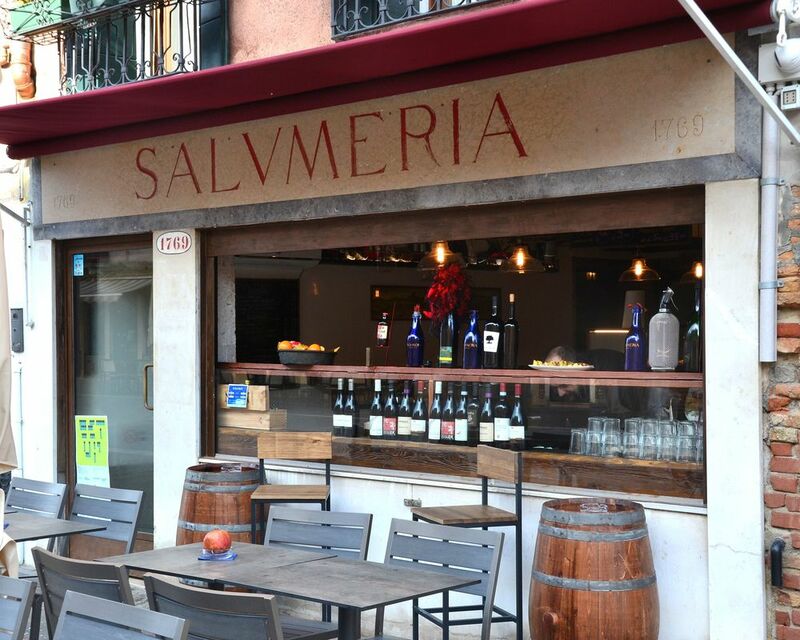 It's neither pretentious nor rowdy, but just the right spot for a relaxed drink, a chat and definitely at least one of Marco's amazing baked polpetti! Serra Dei Giardini, Castello 1284, in the Garden. Serra is, admittedly, so much more than a bar. 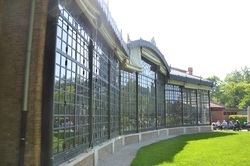 In this reclaimed and restored greenhouse in the Giardini the owners have created a meditative, contemplative and celebratory space enjoyable at all hours. Serra runs a greenhouse, hosts yoga classes and serves wines and cheeses of the world. But, yes! It also a wonderful nighttime venue to either relax in the garden, or dance along to the music. Thanks to its enormous windows and lawn and minimally furnished interior, Serra Dei Giardini is more spacious and airy than almost any other venue in Venice. Go here on those hot summer nights. You can learn more about Serra Dei Giardini on their website. Cantina Antica Vigna, 3818 Castello, Near Sotoportego dei Preti. 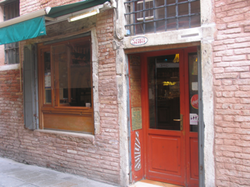 Cantina Antica Vigna is a warm and welcoming little cubby near one of the most romantic, yet least known, landmarks of Venice, “The Heart in Brick.” There a heart shaped brick placed inside the of the Sotoportego die Preti. Legend has it that one who touches the brick will immediately find love, and lovers who touch the brick together will remain together forever. And, Cantina Antica Vigna fits the bill of romantic venues with its cozy and warm red-hued interior, classic design and relaxed patrons. 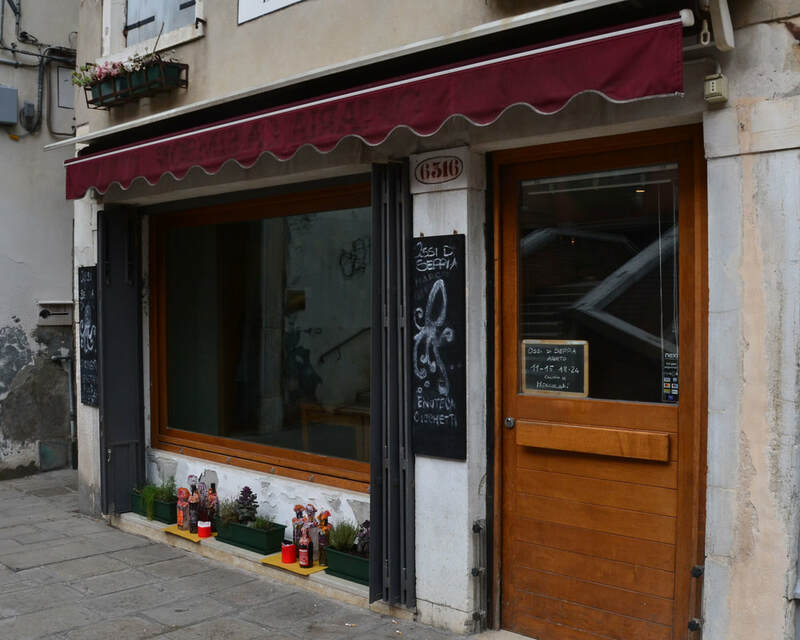 This is one of those well-hidden Venetian gems that is worth the effort to find. 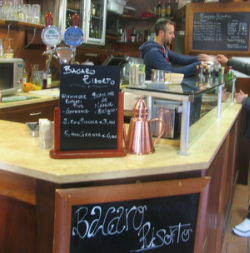 Bacaro Risorto, Campo San Provolo, Near Campo San Zaccaria. Though very close to the major tourist attractions at San Marco and San Zaccaria, Bacaro Risorto somehow manages to maintain a local and relaxed feel. 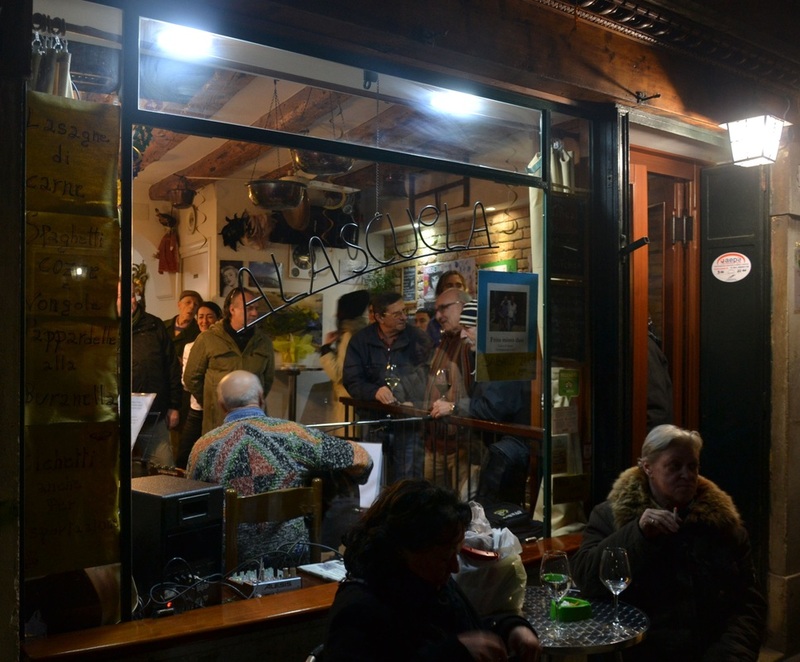 They'll mix any and every drink, they make their own cicchetti and they play the most modern and varied music that you are likely to hear anywhere in the neighborhood. Open from early in the morning, the bar is decidedly a local favorite. People who work and live in the neighborhood stop in at all hours for coffee, spritz, cicchetti, and wine.My home away from home in Venezia! IniShark Irish Pub, 5787 Castello, On Calle del Mondo Novo, Near Campo Santa Maria Formosa. Stepping into the Inishark Irish Pub is almost like stepping out of Venice into another world. That is to say, it's much more "pub" than "bacaro". You'd never guess from outside how large the interior is. Inishark has WiFi, often hosts live music, and is also a great hangout for watching sporting events. They have a large selection of beers as well as a fully stocked bar. What's on tap? Guinness of course!